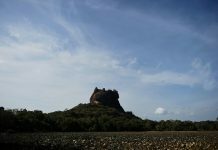 Amidst warnings from politicians of a “bloodbath” if the dispute escalates, tourists are cancelling hotel bookings just as Sri Lankan beaches and major sites like the Temple of the Tooth prepare for peak season. “With the political crisis our winter season is gone,” the director of a luxury beach resort in the south of the island said. “We are monitoring the situation closely and we remain in contact with our counterparts at the technical level,” an IMF spokesman said of the deepening power struggle. Wickremesinghe, a market liberal, has insisted he is still in charge while strongman former leader Rajapakse — already blamed for piling up the island’s debt when he was president from 2005 to 2015 — launched his rival administration last week with measures that caused new jitters. Treasury officials, who asked not to be named, said the revenue loss from the cuts could blow a new hole in the country’s balance sheet. The crisis broke just days after Finance Minister Mangala Samaraweera called for a “coalition of the willing” to stabilise the free-falling Sri Lankan rupee along with other emerging market currencies. The currency has shed more than 14 percent this year and Sri Lanka fears it could slide further as US sanctions squeeze Iran, the island’s chief source of oil. Fitch said however that a protracted political crisis could undermine foreign investor confidence and “make it more challenging” for Colombo to pay its debts.